Kids under the age of 6 year stay complimentary with parents but are not allowed on the game drives. Babysitting services are available at R50.00 per hour and must be booked in advance if required. Family Rooms can sleep a maximum of 2 Adults + 2 kids under 12 years. The room has 1 Double/Twin Beds and a sleeper couch for the little ones. 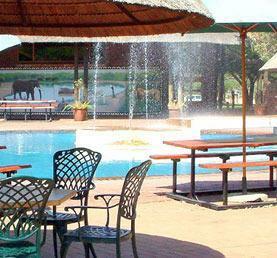 Rates starting from R 1 500.00 per person sharing per night of stay. Kids of all ages are allowed on game drives at the discretion of management. The Family Suite has 2 rooms, one with a King Bed and the other with Twin Beds. 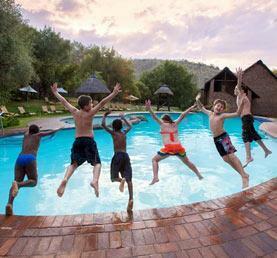 Kids of all ages are allowed on game drives as the lodge is rented out as a whole. Rates from R8150.00 for the 10 sleeper lodge per night self catering. This Family Friendly resort has a large pool and playground to keep the little ones busy. Tours and game drives can be arranged at the resort on check in or you can enjoy the adventure by driving through the park at your own leisure. The self catering chalets sleep up to 5 persons with a Double Bed in the Main bedroom and 3 Single Beds in a loft area. Kids under 12 stay complimentary but are charged directly for meals in the restaurant. 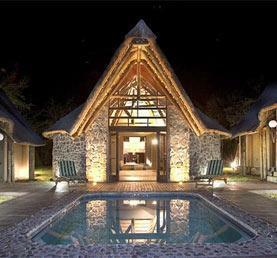 Rates from R 880.00 per person per night sharing. The sister resort to Bakgalta also has a large pool, mini golf and playground for the entertainment of the kids. They also boast a walk in aviary on site. Tours and game drives can be arranged at the resort on check in or you can enjoy the adventure by driving through the park at your own leisure. The self catering chalets sleep up to 4 persons and have a Double Bed in the Main Bedroom with 2 Single Beds in the loft area. Kids under 12 years stay complimentary but are charged directly for meals in the restaurant. Rates from R875.00 per person sharing per night of stay. Kids under the age of 12 years (maximum of 2 per room) are accommodated free of charge on a Dinner bed and breakfast stay with a complimentary game drive per night of stay. Kids between 13-17 years are charged 50% of the adult rates for meals and drives but are still accommodated free of charge if sharing with parents. Kids of all ages are allowed on game drives. Family rooms consist of 2 Double Beds. 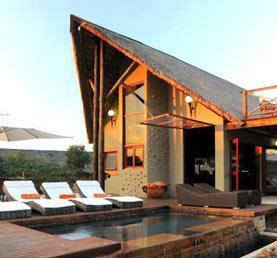 The lodge offers daily games drives as well as a bush braai on a Wednesday and Saturday evening. They have both tennis and volleyball courts as well as a childrens playground and board games. The lodge also offers the junior ranger programme. More information can be sent on request. 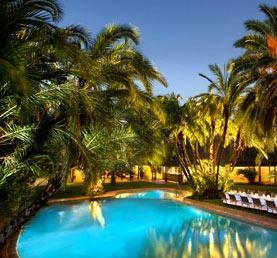 Rates from R1575.00 per person sharing per night of stay. Kids under the age of 12 years (maximum of 2 per room) are accommodated free of charge on a Dinner bed and breakfast stay with a complimentary game drive per night of stay. Kids between 13-17 years are charged 50% of the adult rates for meals and drives but are still accommodated free of charge if sharing with parents. Kids of all ages are allowed on game drives. Family Rooms consist of 2 Double Beds or a Double Bed with a Sleeper couch. 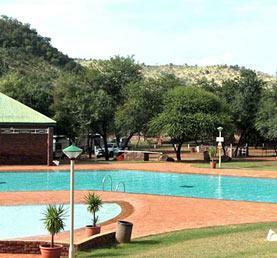 Kwa Maritane has 2 pools in addition to their baby pool and slide. They boast 2 tennis courts, bush putt putt and a children playground with a trampoline. 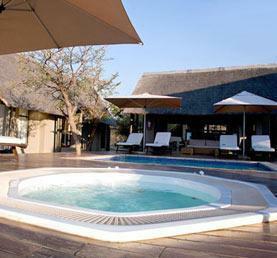 The lodge also has a underground hide which allows you to watch any animals visiting the lodges waterhole. Kwa Maritane as well as Bakubung offers the junior ranger programme. More information can be sent on request. Rates from R 1 575.00 per person per night sharing.